In 1970, Hunter S. Thompson was looking to become the new sheriff in town -- the town being Aspen, Colorado. 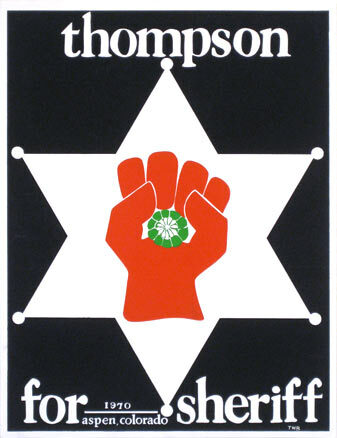 In a heated election, Thompson ran against a traditional, conservative candiate, Carrol Whitmire, on what he called the "freak power" platform, which mostly called for the legalization of marijuana and unconventional environmental protections. As Thompson later explained in his essay "Freak Power in The Rockies," hundreds of Haight-Ashbury refugees moved to Aspen after the ill-fated “Summer of Love” in 1967, and they became part of the general population. In the town, registered Republicans historically outweighed registered Democrats by a two-to-one margin. But both camps were outweighed by independents, which included "a jangled mix of Left/Crazies and Birchers; cheap bigots, dope dealers, nazi ski instructors and spaced off 'psychedelic farmers' with no politics at all beyond self-preservation," remembers Thompson. So, winning an election came down to registering indie voters and getting them to the polls -- something that was easier said than done, it turns out. In the short term, Hunter S. Thompson lost the "Battle of Aspen" by 300-500 votes, depending on whose accounts you read. In the long-term, he arguably won. 42 years after Thompson made the legalization of marijuana his central campaign promise, Colorado voters passed Amendment 64, legalizing marijuana for recreational use. Somewhere, the would-be gonzo politician is smiling. Once a good author, he degenerated into a cliche, incapable of continuing his earlier, sometimes brilliant prose. Call him fool.